While there&apos;s no shortage of things to do outside in New York this winter, there&apos;s plenty of sporty action indoors as well. Looking for thrills and chills without braving the elements? You can stay warm in the stands while watching the fastest team sport in the world: professional hockey. The games are filled with contagious energy, rushes of adrenaline and nonstop entertainment. New York State is home to five AHL teams, built on intense rivalries that make for many nights full of cheering and laughing with family and friends. on the Utica Comets at The Aud in Utica, or the Syracuse Crunch at the War Memorial Arena in Syracuse, in addition to the Albany Devils, the Rochester Americans and the Binghamton Senators. In New York City you can cheer on the Knicks and Rangers at Madison Square Garden, and watch the Islanders and Nets at the Barclays Center. 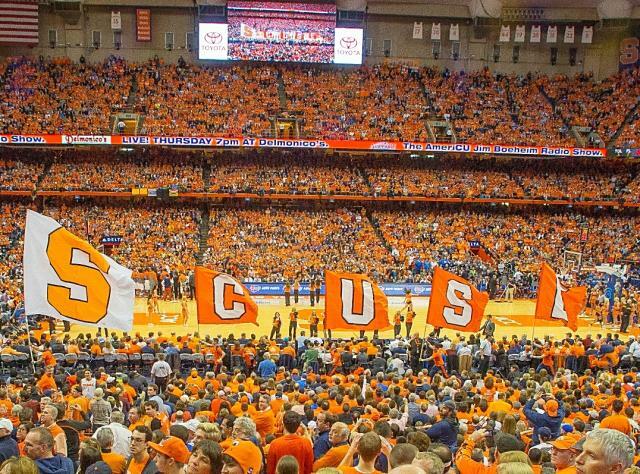 And for a true college basketball experience, head to the Carrier Dome at Syracuse University, the largest on-campus basketball arena in the nation where the Orange is "New York&apos;s College Team." And if you&apos;re looking to take in world-class winter sports, check out bobsledding, figure skating, luge and more at the Olympic Sports Complex in Lake Placid.